Habitat: Wooded and forested land and open country. 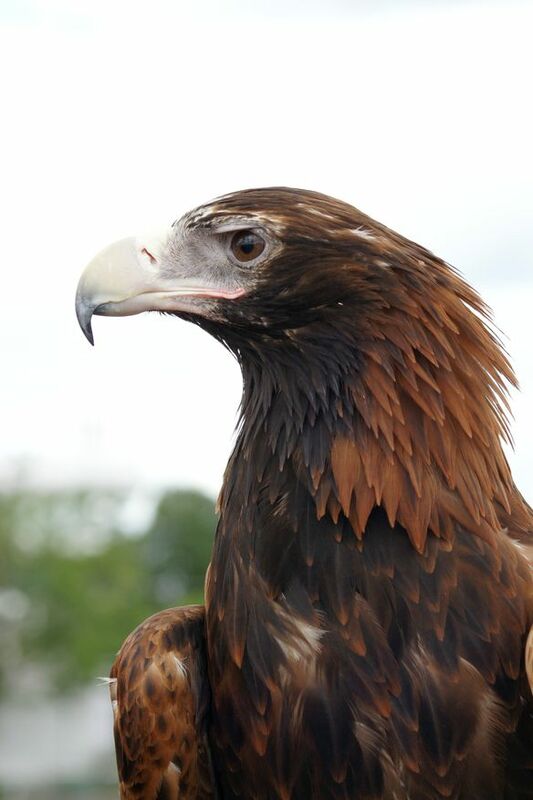 Wedge-tailed Eagles are Australia's largest birds of prey (raptor) and one of the largest living eagles in the world. The Wedge-tailed Eagle has long wings (wingspan 2.3 m), a characteristic long, wedge-shaped tail, and legs that are feathered all the way to the base of the toes. The bill is pale pink to cream, the eye brown to dark brown, and the feet off-white. Young Wedge-tailed Eagles are mid brown in colour with reddish-brown heads and wings. They become progressively blacker for at least the first ten years of their lives; adults are mostly dark blackish-brown. The only difference in plumage between the sexes is that a female adult is generally slightly paler than her mate. Females (4.2 kg - 5.3 kg) are also larger and heavier than males (3.2 kg up to 4.0 kg). The Tasmanian subspecies (Aquila audax fleayi) is listed federally as endangered. The Wedge-tailed Eagle is found throughout mainland Australia and Tasmania. 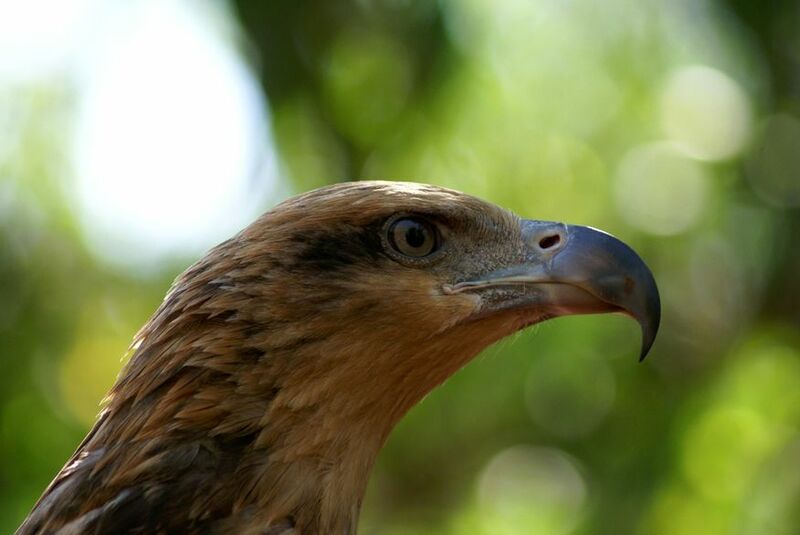 The Wedge-tailed Eagle is found from sea level to alpine regions in the mountains, but prefers wooded and forested land and open country, generally avoiding rainforest and coastal heaths. Eagles can be seen perched on trees or poles or soaring overhead to altitudes of up to 2000 m.
Wedge-tailed Eagles build their nest in a prominent location with a good view of the surrounding countryside. It may be built in either a live or dead tree, but usually the tallest one in the territory. In some parts of Australia, where tall trees are absent, small trees, shrubs, cliff faces or even the ground may be used. The density of active nests depends on the abundance of prey and other resources. In most years, nests are usually 2.5 km - 4 km apart. If conditions are particularly good, the distances apart may be less than 1 km because the birds require smaller areas to find sufficient food. Wedge-tailed Eagles eat both live and dead prey (carrion). Their diet reflects the available prey, but the most important live items are rabbits and hares. Rabbits usually comprise about 30-70% of the diet, but may comprise up to 92%. The introduction of the calicivirus has resulted in the decline of rabbits in many parts of Australia. It is not yet known how this will affect the Wedge-tailed Eagle. Other food items include lizards, birds (weighing over 100 g) and mammals (usually weighing over 500 g). Wedge-tailed Eagles will kill lambs, but these make up only a small percentage of their total prey. Carrion is a major food source. Roadkills and other carcasses are readily eaten. Many of the reports of predation on lambs result from birds scavenging already dead animals. Up to 20 birds may attend a carcass, although only two or three feed at any one time. If possible, please remove dead carcasses from the road to prevent eagle deaths as they cannot take off as quickly as many other birds can and are often killed by vehicle collisions while feeding on carrion. 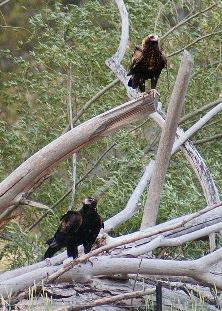 Wedge-tailed Eagles may hunt singly, in pairs or in larger groups. Working together, a group of eagles can attack and kill animals as large as adult kangaroos. 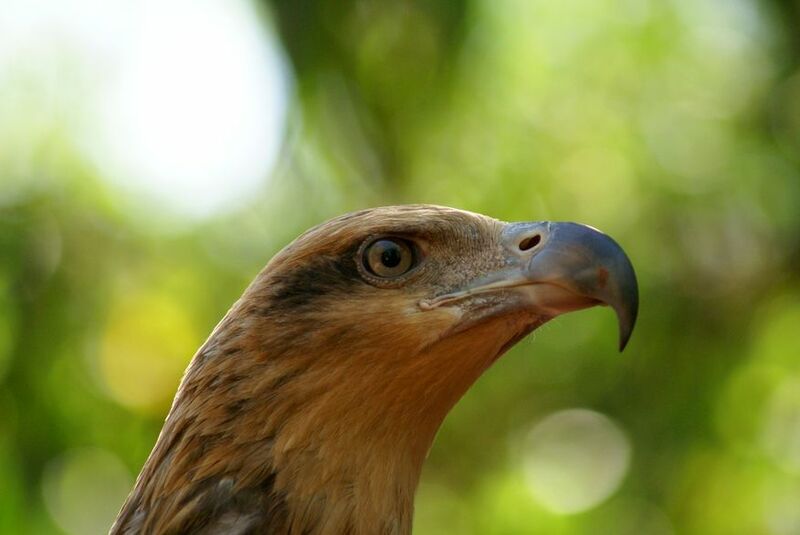 This explains the scientific name of the Wedge-tailed Eagle which means 'bold eagle'. Under ideal conditions, an eagle can lift about 50% of its body weight. Often, eagles may cache food items on a branch near the nest area. Wedge-tailed Eagles are monogamous and apparently mate for life. If one bird of a pair is killed, the survivor will find a new mate. 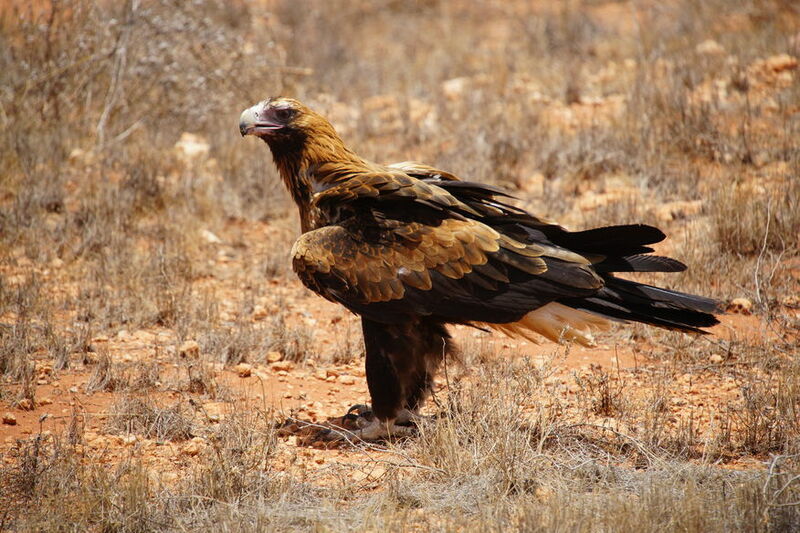 Established breeding pairs are territorial and live in the one area throughout the year, defending around their nest sites from other Wedge-tailed Eagles. (They are known on occasion to attack intruding model airplanes, hang gliders, gliders, fixed-wing aircraft and helicopters.) Surrounding the territories are large home ranges in which the birds hunt for food but do not defend. There is usually overlap between the home ranges of two or more breeding pairs and of non-breeding birds. The nest is a large structure of dead sticks, usually reused for years, often reaching considerable size. Nests 1.8 m across, 3 m deep and weighing about 400 kg are known. Nests have a shallow cup on the top, lined with fresh twigs and leaves. Sticks are added by a bird while it stands in the nest. If these sticks are dropped outside the nest, no effort is made to retrieve them. Piles of dropped sticks 1.8 m high have been recorded under the nest trees. The timing of breeding may vary from location to location and from year to year according to the local availability of food. Both parents share in the duties of nest building, incubation and feeding of the young. A clutch consists of white eggs measuring 73 mm x 59 mm with varying amounts of reddish brown spots and blotches. These are laid at intervals of two to four days. Incubation starts with the laying of the first egg. Because of the intervals between laying, the eggs do not hatch simultaneously. The first chick hatches larger than the second, which in turn is larger than the third. Survival rates of the chicks vary considerably depending on local conditions, including prey abundance and the amount of disturbance. A breeding pair usually rears only one young per clutch, although in a good year, two chicks may fledge in some nests. Because of the differences in size, the oldest and largest chick has the best chance of surviving. If food is scarce, it will kill and eat its smaller nest mates. Chicks hatch covered with a white down. For the first five weeks or so, the adults must deliver food to their mouths. After this time they are able to recognise bits of food on the floor of the nest and can feed themselves. The young acquire their first feathers during the second week after hatching. If threatened by predators, the chicks lie flat in the nest, but will defend themselves if required. The adults, in contrast, make little defence of the young. The juveniles remain with the adults for about 11 weeks after leaving the nest. Young and non-breeding birds disperse, moving to wherever conditions are suitable. Juveniles are known to have moved over 850 km in a seven to eight month period. The Wedge-tailed Eagle is the most common of the world's large eagles. It is nonetheless affected by several human activities. It has benefited by the opening of forests in eastern Australia and the increased availability of rabbits. 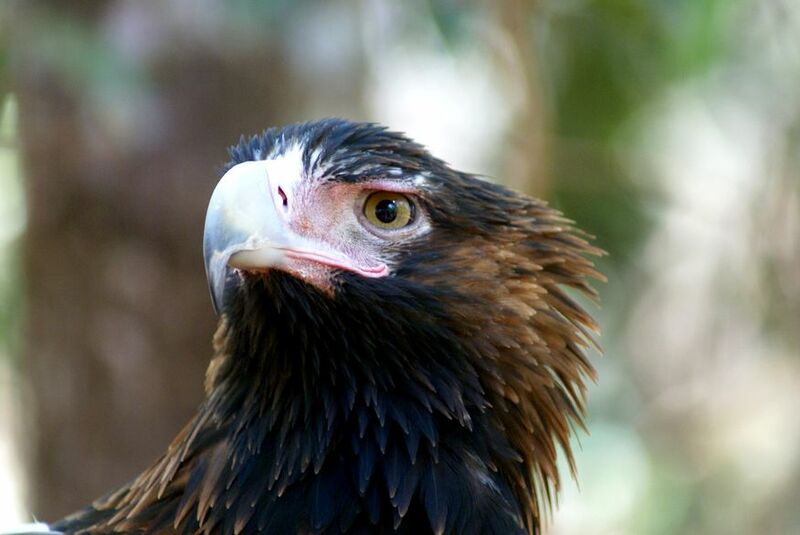 Wedge-tailed Eagles however, are sensitive to forestry operations. In the more arid zones, extensive clearing has reduced the nesting resources. If a breeding pair is disturbed when they are preparing to lay eggs, they may abandon the nest. Wedge-tailed Eagles were persecuted for many years for supposedly killing lambs. Bounties were offered for dead eagles, and large numbers were poisoned or shot – 147 237 in Western Australia in 1928 -1968 and 162 430 in Queensland in 1951-1966. Indirect poisoning through Dingo baits and pesticides continues to be a major hazard. In Tasmania, the Wedge-tailed Eagle is threatened by habitat loss and deliberate persecution.